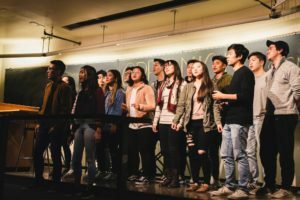 Bayanihan Activities, along with Alay, a print publication under Bayanihan, and Isang Himig, the a cappella group affiliated with Bayanihan, collaborated to create their Open Mic Night on Nov. 19. There were about 15 performances from a mix of duos, trios and solo artists. 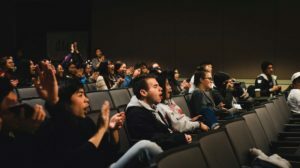 On the Monday before break, performers and excited audience members gathered for Bayanihan’s Open Mic Night. 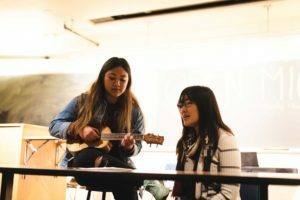 About 40 students met in Room 152 of the Jack Baskin Engineering Building to perform original music and spoken word compositions. Photo by Nikolasi Saafi. Bayanihan Activities brings people together through events and allows for creative interaction among different communities. Bayanihan and Isang Himig member Raizel Negranza (left) performed a soothing duet with a friend on her ukulele. 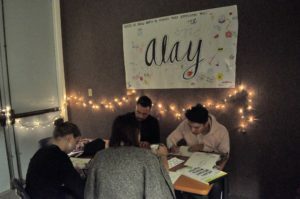 Alay, the art and self-expression aspect housed under Bayanihan, helped organize the arts and crafts table where attendees drew doodles and designs as others painted watercolor landscapes. Many members of Isang Himig, the a cappella group affiliated with Bayanihan, sang at the event. Brandon Sugars, a member of Isang Himig, spoke to City on a Hill Press about the goal behind Bayanihan’s Open Mic Night.